There was a distinct plan of attack for the Balfe Motorsport team at Silverstone at the weekend. Get to the finish! The first two rounds of the championship had promised plenty – with third on the GT2/G2 grid behind the works Porsches at both attempts. However, it had left the Newark Glass Group, KIA Spirit and Spirit Volkswagen-backed team with one non-classified result and a non-finish. So, seeing the chequered flag without problems was its main ambition. 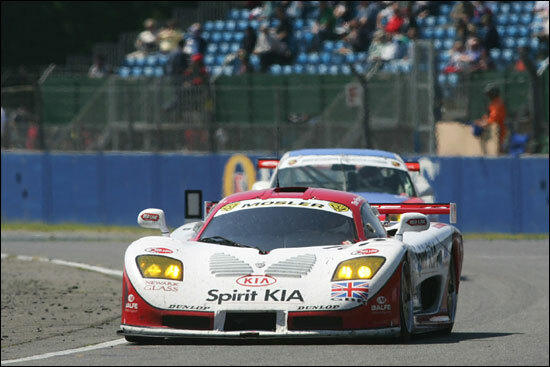 Free practice gave the team the chance to fine tune the Spirit Kia Mosler to Silverstone’s International layout. There was the strange quirk that for once this year here was a track that Shaun Balfe had raced on (and won at too - the opening round of the 2001 British GT Championship), whereas Jamie Derbyshire, a man with a year’s FIA GT under his belt already, had never raced on the International circuit. The cooler weather on Friday meant that getting an ideal set-up was proving harder than the team would have liked, with the front end of the Mosler struggling for grip in certain corners. It wasn’t a major issue though and both drivers were happy that they had a car that was good for three hours come Sunday morning. The team was noticeably closer to the two GruppeM cars than at either of the two previous rounds, the twisty nature of the smaller circuit clearly suiting the Mosler. The opening Saturday qualifying session proved to be a short lived boost for the team, with Shaun ending the session in P2, with a time of 1m 21.152. The Collard / Sugden Porsche was struggling throughout the session (with a rear wheel bearing that was about to fail), setting a time slower than it had done the day before in free practice. The team knew that the Porsche would be capable of going quicker in the second session and Shaun was ready to have another go at keeping his position. An incredibly busy track left him frustrated, though, his tyres coming good on a lap that was too busy, and ending any chance of improving the time. His frustration was compounded even more when Collard managed a time that was just one tenth of a second faster than the Mosler. A solid result on race day was still at the forefront of the team’s mind though, and they were happy with being ever closer to the GruppeM squad. Sunday morning started with some banter in the team garage, this weekend being shared with the Eclipse Mosler squad. The Balfe crew have known the Eclipse boys for a few seasons now so, it was no surprise that mickey-taking was high on the agenda over the course of the weekend. Team-manager Simon Ranyard was first in line for the flack when he was asked if he’d seen the image of himself on DSC’s Saturday gallery (right)! The image of Jamie standing behind him looking like he was about to give him a slap gave the Eclipse boys plenty of ammunition for an early Sunday start. All we can say is that Goodwin and Lord maybe ought to avoid the garage for a round or two! Jamie took the helm for the warm-up and immediately got up to speed, setting his quickest time of the weekend so far, on full-tanks. The short 15-minute session passed without incident and a swift pre-race prep. made sure the car was good to go as soon as the pit-lane opened at 9:50am. A demon start by Shaun meant that he got alongside the two works Porsches as the field dived into Copse for the first time. As he had the inside line he considered holding his position and taking the lead. However, the thought of seeing the chequered flag once again crossed his mind, and he decided that tucking back in was a better course of action. The Porsches soon got into their stride and Rockenfeller in particular set off like a scalded cat, pulling off an impressive pass round the outside of one of the GT1 Saleens on the opening lap, and setting some impressive lap times to open up a gap to the Mosler. 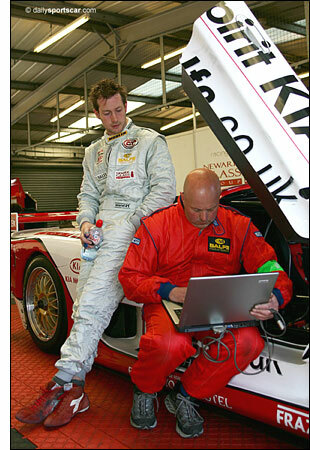 Shaun settled into a good rhythm and was pulling away from the TVR and Embassy Porsche at around a second per lap. With the cars behind him battling for position, all Shaun had to worry about was finding a clear route through the back marker traffic mid-way through his stint. As the Porsches pitted first he moved into the lead of the class for a handful of laps, before he too had to pit, handing over to Jamie for a long middle stint. A swift change-over put Jamie back out again in third place. By now the traffic situation was at its peak, and with a handful of cars not realising the Mosler was lapping them, they wanted to race. 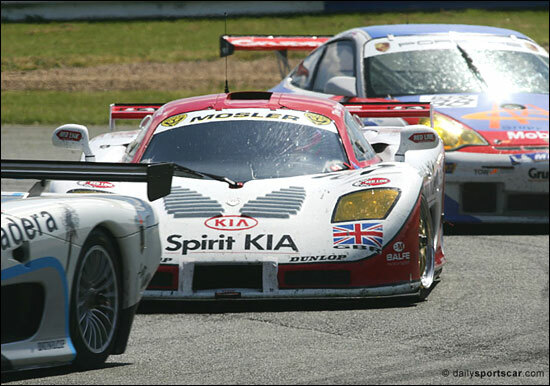 Both drivers suffered with slower GT2 cars thinking that they were managing to hold them off for position. Although his stint passed without incident, Jamie had lost a little time to the LNT TVR, which had been forced to make an early stop owing to a suspected puncture. It had now leapfrogged the cars behind Jamie and was able to bring down a little bit of the gap to the Mosler. However, Jamie was comfortably clear and had the added bonus of suddenly becoming P2 on the timing screens! The number 88 GruppeM car was suffering from a broken water pipe, dropping it well down the order and proving that even the Porsches have their problems. Jamie brought the car in to the pits to hand back over to Shaun with just 34 minutes left on the clock - and a healthy lead to take to the chequered flag. That signalled victory in G2, and effectively second in GT2. “It’s great for the team and for Mosler to have finished,” said Shaun afterwards. “We’ve proved that we’re on the cutting edge of the development with the car and are closing the gap to the Porsches all the time. We’re still a small team with a big heart and we want to improve and do better. We will have to see what happens over the next few rounds,” he added. “It was a good race for us,” said Jamie. “To finish first in G2 and effectively second in GT2 is great. The car ran faultlessly and the team did a brilliant job for us over the course of the weekend. We’re very happy to have finally taken the flag, especially at our home event and in front of our sponsors and guests,” he said. The team now gears up for what it hopes will be another good result, in round four at Imola.